In recent times, he has spent much time in Japan, releasing recordings for the Japanese C.U.G. label, including Lowdown Hoedown (CUG, 2017) with baritone saxophone great, . Still there was a large portion of the jazz universe yet to be introduced to the this northwest legend. Thomas decided to release a recording on the Seattle based Origin label, whose well regarded distribution model would assure a worldwide listenership, and gift to the jazz world a long overdue re-introduction to a remarkable musician. He at last decided on a format, a ballads based album with arrangements by German composer/arranger . Thomas had forged a friendship with Groenewald after the composer moved to Orcas Island in Washington State. His lush, colorful arrangements of classic ballads would seem to be the perfect harmonic canvas for Thomas to be featured on five instruments. The band would be recorded in open space, without isolation or overdubs. The first three tracks directly introduce us to the talents of Thomas, being featured on trumpet, tenor and soprano saxophones. The opening salvo is a deeply emotive take on 's "Yama." Thomas' original, lyrical sound is front and center on any instrument, but trumpet was where the journey began for him, and there seems to be a fluid stream of consciousness to his solos on that instrument. Pianist 's work is as well strong, and free flowing. 's "Ernie's Tune" features a very eloquent Thomas on tenor saxophone, with a tone that is large and spacious. He tends to lag just a bit behind the beat much like Gordon himself, defining points with vibrato beautifully articulated. The title track is penned by Groenewald, and features Thomas on soprano saxophone interspersing melodic interludes between a multi-layered harmonic structure, centered on the rhythm section of pianist Hansen, bassist , and drummer . Thomas expresses a mood of romanticism and melancholy, with ardent tonality and graceful cadence. Thomas' alto work on the piece, "Ballad For The Very Tired And Very Sad Lotus Eaters," and the beautiful classic, "Soultrane" speaks volumes about the blue soul of his playing style, and the original voice that has grown out of it. One gets the sense that he would be as comfortable in the 1920's as he would roaming the clubs of 52nd St. in the mid 1940's. His sound, his entire jazz persona would jive perfectly with the hard bop movement of the 1950's, as it has in a post bop modern sense throughout his half century in the music. Legacy is a fleeting notion. It is incomprehensible in real time when a career hits high points, when certain doors open to quantitative opportunity. Jay Thomas can tell you a thing or two about that, based on his own personal experience as a jazz artist over half a century. His story includes playing on the Seattle scene as a teenager, leading to opportunities hampered by among other things, drug addiction. It is as well a story of overcoming those obstacles and producing an impressive legacy of recording and performance credits. It could well be that Thomas, who just turned 70 years of age, is producing his finest work in current times. He recently united with German composer/arranger Oliver Groenewald , producing a brilliant album for the Origin record label titled I Always Knew (Origin, 2018). At last, this recording will provide the opportunity for his music to orbit around the jazz universe, outside of the Pacific Northwest where he has attained legendary status. "In jazz, age doesn't matter. They would like to sell it like it matters, but it didn't matter in the fifties, and it doesn't matter today. It didn't matter in the forties," says Thomas. Indeed. Thomas is one of a rare few who can apply virtuosity to both the trumpet and saxophone. On I Always Knew, he is featured on trumpet, flugelhorn, alto, tenor, and soprano saxophones, surrounded by Groenewald's Newnet, a nine piece ensemble of top shelf players. Getting together with Thomas to talk about his career, is akin to two friends having a long conversation over cups of green tea. There is talk about the great players who led the way for him as a teenage phenom on the Seattle scene, about time playing with the likes of Cedar Walton, Larry Coryell, and Billy Higgins. There are insights into a man with a kind and gentle soul, and a great genius within. There are moments of laughter inspired by his humorous witticisms. Thomas grew up in the middle of the fertile jazz scene of the sixties in Seattle. While still in high school, he was subbing for Seattle trumpet and saxophone legend Floyd Standifer at the famous Black and Tan nightclub at the corner of 12th Avenue and Jackson Street. "I did one thing in high school for Floyd, playing with Chuck Metcalf, who had written all these arrangements. He had all of the cream of the crop players around him," says Thomas. Standifer would as well be an inspiration for Thomas to double on saxophone as he did, something that would take several years to come into fruition. Nonetheless, Thomas continued to associate with veterans on the scene in Seattle, and assimilate everything he could to add to his personal creative base. Having the opportunity to play afternoon sessions at the legendary Black and Tan bottle club on 12th and Jackson proved to be key. "I used to go to sessions at the Black and Tan. Jim Walters and those guys were down there. They became Ball and Jack, which became War.They never checked my ID. They had sessions on the weekends, on Saturday and Sunday afternoons. Those sessions was when I first understood the changes that were being played. Ronnie Buford (organ) was playing. Pops Buford was kind of the man, he not only a great saxophonist, but he sold dope also. Bernard Blackman was on guitar, Tommy Henderson played drums. It was really cool. It was kind of out of the way, because it was a bottle club, they just sold setups," remembers Thomas. He played in R&B bands then as well, integrating jazz sensibility into what became known as the Seattle Sound with such artists as Dave Lewis, as well as Jimmy Hanna of Dynamics fame. "When I was sixteen, I was starting to figure it out, and we did this album. Jimmy Hanna Band," recalls Thomas. The band played an eclectic mix of R&B, jazz, blues and rock, and backed many touring acts passing through the Pacific Northwest. The personnel was remarkable as well, including soon to be jazz star Larry Coryell on guitar, and trumpet ace Mark Doubleday. Still a high school junior, Thomas began to gain a reputation as a formidable player, with a deep connection to the blues expressed through a style often described as melodic and lyrical. His probing style on trumpet began to reflect the progressive changes in jazz largely due to saxophonists like John Coltrane. Thomas began interpreting those sounds while on the bandstand playing within other musical forms. His first taste of nightlife as a professional was at the House Of Entertainment in Pioneer Square. He recalls, "My first steady gig was at the House of Entertainment, at Occidental and Washington. It was open from 11PM until 4 AM. I was a junior in high school. This was dance stuff. We improvised for days. We loved Coltrane and stuff like that. We'd be playing, and there'd be some vamp, and the old guys would be looking at me saying, 'Wow, what kind of a scale is that?' Ron Soderstrom was instrumental in getting me gigs. He got me the gig at the House of Entertainment. I played with Jimmy Pipkins and the Boss Five. We had a hit they were playing on the black radio station called "Walkin' The Duck." Can you imagine that?" Thomas was surrounded by older musicians of every sort, defining a unique musical crossroads in Seattle between jazz, R&B, rock and soul music. Hammond B-3 master Dave Lewis, who played not only a prominent role musically but was largely responsible for the integration of Seattle's formerly segregated musicians unions, was among the now historic artists who took a chance on the young Thomas. He saw the budding talent within. B-3/ trumpet master Sarge West, who essentially taught Larry Coryell how to play, was a major influence as well. "The best lessons I ever had were from a guy named Mike Mandle, an organ player from Seattle. He played in Larry Coryell's Eleventh House. He was so great. Now he does all the music for Ellen Degeneres, and lives in New York. He taught me "Blind Man, Blind Man" down at the Black and Tan. I became his student in high school. He had no teaching materials. I had to learn it from him, which was good," recalls Thomas. That process of learning via the oral tradition, would eventually influence his approach as a mentor as well. Thomas cites saxophonist/vocalist/comedian Gerald Brashear as an important figure not only in his personal journey, but as a major contributor to the jazz lineage in Seattle. "I played a couple gigs with him when I was sixteen. He also came in and terrorized me when I was on Dave Lewis' band," says Thomas. Brashear brandished his amazing triple-tongue technique on saxophone and voice, giving a young Thomas a seemingly impossible standard to strive for. "He could triple tongue on the tenor. People talk about Jazzmeia and how good she is, and she is. But these guys were fifty times better. He could do stand up comedy, he could have been real famous. Instead he went to McNeil Island for drug use. That's a civil rights issue. On tenor, he did some triple tonguey things, he was so fast. Singing, you could transcribe it, it was all notes. It wasn't barnyard stuff. Nobody triple tongues on a sax. Gerald did," says Thomas. He continues,"When I think of Gerald and that whole scene, I was a kid, and my dad played. They had one jazz festival out in Mountlake Terrace, and this guy named Jerry Carasco put it on. Jerry Carasco was an amateur singer, with a beautiful voice. He knew all these jazz players. He later on became paralyzed. He had a gardening business and someone hit him in his truck when he was on his way home. After that, he couldn't sleep at night, and he painted rocks and things. I have some Jerry Carasco artwork. At the time he put on this jazz festival, because he just loved the music." "I remember it was in this canyon up in Mountlake Terrace in the summer. The headliners were Chuck Metcalf, Dave Coleman and Gerald Brashear. They all came riding in on this giant horse. There was the three of them on the horse, and they jumped off and Gerald did his stand-up, and played the rivets off the saxophone, and that was it. I thought, 'Whoa.' Even as a novice kid, who didn't know anything about jazz, I knew those guys were very good. I knew that, without knowing anything." Lewis provided some comfort and insight for the young trumpeter after his abrupt introduction to Brashear's talents on the bandstand. He provided a truth that listeners can attest to today in Thomas' playing-a modern approach to melodic improvisation. "I love your playing. I like you better than Gerald, you play so melodic," he would say. Seattle in the mid-sixties was a city riding a high generated by the the Century 21 Exposition, the Seattle World's Fair in 1962. Nearly ten million people visited the Emerald City that year, exposing the world to its burgeoning culture, and geographic splendor. On the local music scene, there was work. For a jazz musician, that usually meant playing music that wasn't jazz, one needed to be a bit more utilitarian to make a living. Though only a teenager, Thomas was discovering this reality in real life. "Jazz wasn't a career until later, and then for only a few. If you were a good player, you were going to be in some other kind of band, period. There were a few jazz gigs that were kind of commercial. Floyd Standifer was the only horn player I knew that actually played full time. In those days, there were many free standing jazz clubs. There are hardly any anymore. It was a different world, says Thomas in reference to those times. There seemed to be a renaissance of great players converging in Seattle in those days, all contributing to an overall sound that seemed to express the great tradition of jazz culture in the city, an interpretation performed comfortably in listening and dance environments alike. One legendary gig took place at The Embers, a club in West Seattle that included Trumpeter/organist Sarge West. West had a trumpet sound that spoke clearly to the then teenaged Thomas. "Sarge West, he taught Larry Coryell basically how to play. He was the most talented trumpet player I'd heard as a young guy. Sarge, Larry and Dean Hodges had a legendary long term gig at The Embers. You could see the Seattle skyline from West Seattle. They had this gig there, and a young Randy Brecker, right when I was starting out, was around and at sessions. He followed a girl out here, and he stayed for three or four months. He was all over the place, and I would see him all the time. We got to be friends, even though I was quite young," says Thomas. Jazz in the late sixties was firmly in the throes of post-bop, and entering into the era of fusion, with hard bop beginning to phase out. In many ways, it was the very end of a connection to dance music, and a full on consolidation of the form in its status as a performance art. In Seattle, people danced to bebop, and still in its later hard bop incarnation. Recalls Thomas, "When jazz became just this listening thing, and that's great, it kind of diluted the blood quite a bit where it's not attracting a new audience other than people who have been indoctrinated in jazz. In those days, jazz was like boogaloo. A lot of bands would be picking up on jazz things. They'd be playing things by Cannonball Adderly, or Bobby Timmons. Art Blakey's band was still dance related stuff. So was Horace Silver. The hard bop thing is kind of the end of the road for dance. The used to dance to bebop!" Thomas' teenage years were accentuated by recognition from Downbeat Magazine and Leonard Feather, resulting in a year of study in Boston at the Berklee School of Music. In 1968, he moved to New York, landing a notable gig in Machito's Latin Band, and he recorded with James Moody as well. He studied trumpet with Carmine Caruso, and in 1971, discovered the flute and tenor saxophone. Though largely known as a trumpet player, Floyd Standifer was a skilled saxophonist, and exhibited these talents in and around the Seattle club scene Thomas frequented as a youngster. In later years, Thomas would encounter the same musical dualism in veteran Ira Sullivan. For reasons in terms of embouchure and technique, there are few that venture into this realm. Thomas found it quite natural. "For me it was pretty natural. Especially in those days when I would go the way that water would naturally flow. I was playing trumpet and I fooled around on my sister's flute. My younger sister had a flute around the house. I learned how to go up and down the scale. When this whole hippie thing really started hitting, I was in Boston and I got a flute. I was in an apartment and it was quiet, you could play it. The trumpet embouchure is a very small opening, your actual aperture. The aperture on the trumpet is so much like that on flute. One day I'm playing the flute, and instead of getting that immature amateur sound, which is hollow, all of a sudden I accidently got into having a professional sounding tone. I was getting all the harmonics in the sound. I was actually focusing the air, and it was hitting the back wall of my head joint, causing this whole harmonic wall along with the note. I recognized this is something," he says. Thomas was living the jazz life in New York City, along the way dodging, and at times, falling into the many social distractions along the way. Still, while living in the now iconic Albert Hotel, he discovered the tenor saxophone, and in the process, his musical and creative identity. While Thomas' history is full of colorful tales, this one in particular is career defining on one hand, and as well foretelling of struggles he would encounter going forward for at least another decade. He was just twenty years old, and now had one of his original compositions on a major jazz release. James Moody recorded "The New Spirit" on his 1970 release, The Teachers (Perception, 1970). "When I was living in New York, I was living in the Albert Hotel. It was like the sister of the Chelsea Hotel. It was in the village, pretty close to Bradley's. A lot of musicians stayed at the hotel, in and out. So I'm in the Albert Hotel, and my neighbor had a big bag of speed, always. I was with saxophonist Joe Brazil, and he wanted to try my trumpet-he was playing my trumpet and making no headway at all. I was holding his saxophone, and I put all the keys down and started to play it. In about five minutes I was basically playing the sax. I didn't do anything, like Jerry Bergonzi who teaches the no embouchure system." He continues, "From the trumpet I knew how to focus the air, and I knew the fingerings from the flute. In about five minutes it was sounding pretty good, and my friend put a stop to that ! At that moment, a light went off in my head, and I knew I had to get one of these. When I was back in Seattle, I was playing with this band. The first sax I had was a baritone. I got my mouthpiece cover stuck in the curve of the baritone, so when I would hit a certain note, it would just shriek this Albert Ayler thing-and I was playing a rock gig! I'm soloing and shrieking, and everyone loved it. I'm thinking that no, something is wrong! I'm not trying to get it to shriek." "Shortly thereafter, I got a tenor. There was this guy named "Speedball," and he had this apartment. There was no furniture in the apartment. It was painted this weird institutional green. I go inside and he takes out this tenor, and it had this string wrapped around it. I got it for like $25, and had a guy completely re-pad it. The other thing about this guy "Speedball." He had no furniture, but he had one album that was right next to the door, and it was Bobby Bland, Two Steps From The Blues (Duke/MCA, 1961). It was weird. So I got into sax after that. This was in 1970, I was twenty one. I started to download to sax as quickly as I could. The kind of music I was on, it was better. It helped me be employed and I loved it. When I was in high school, I really got bit by the Trane bug. My favorite musician was not a trumpet player, it was Coltrane," he recalls. Thomas moved to the San Francisco area in the mid-seventies, now armed with his new found skills on saxophone and flute to add to his considerable trumpet prowess. His formidable skills were now a well known quantity in the jazz world, and gigs with pianist Jessica Williams cemented his status on the scene in the Bay Area. So many of his musical acquaintances were working gigs in and around the perimeter of a national jazz scene screaming for recognition within the progressive rock explosion of the late sixties through the mid seventies. So many of these legacy musicians who were taking post bop jazz forward in the new decade were being largely ignored. Players such as Joe Henderson, Freddie Hubbard, Gary Bartz, Eddie Henderson and George Cables were struggling to gain the recognition their jazz forefathers had received. Rock, and soul music via Motown were dominating the pop charts. "The jazz guys I knew, the very best ones, were playing with Blood Sweat & Tears, and people like that. Randy Brecker would have stayed with them, but he didn't think they were going anywhere. When they hit it big, he was out making $150 a week with Horace Silver. Later on, he and his brother Michael made their money in the studios." Thomas moved back to Seattle in 1978, and began to frequent Parnell's Jazz Club in the Pioneer Square neighborhood. Thomas' dad had bought the intimate jazz spot from Roy Parnell, and between the two, began to book artists more from the hard bop/ post bop lineage. The room had magnificent sound, and the Thomas' fitted the venue with tables, stuffed chairs and couches, a real living room type of feel. Thomas performed at Parnell's with such notables as George Cables, Bill Mays, Harold Land, and Slim Gaillard, and made friends with jazz legends such as Sims, and Sal Nistico. The relationships formed there opened several doors of opportunity for the multi-instrumentalist, some of which he took advantage of, and some not. Thomas had trouble running in the background of his life in the form of addiction, that was impeding his progress as a musician, and negatively impacting his relationships with friends, professional colleagues, and family. He began to gain a notorious reputation for unreliability, and yet still continued per his considerable talents to receive opportunities to elevate his status among the jazz elite. "When Roy had it, I played one week with Harold Land. At this period, I was getting a certain amount of calls. I had been down in the Bay Area, and it got me back into playing jazz after years of dance music and free-standing stuff," he says. Thomas' dad Marvin, concerned about his son's heroin addiction, made the then common assumption that keeping an addict busy was the key to rehabilitation. He did everything to set up his son with performance and recording opportunities His first idea was that Jay and his second wife would run the club. "I was a complete numbskull," says Thomas. "I was playing a lot, but was also a full time junkie since the age of nineteen. So while everything is going on, I have this thing running in the background creating a lot of turmoil, eating up all my time and resources. I was fighting several wars at once on several fronts. My dad thought the key to me kicking my habit was to be busy. It's kind of a joke now. We had Red Rodney and Ira Sullivan at the club. I was a big fan of Ira, go figure-sax and trumpet. The guys in the band were my age and slightly younger, and I got in with those guys. One night, I sat in, and was a little high. Both Ira and Red were addicts too. Red encouraged me to come to New York, and I went for three months. I had no support." Being in Gotham, the center of the jazz universe was a revelation in terms of his professional and personal life. Thomas' pensive, melodic approach to playing had become an identifiable sound that appealed to a variety of bandleaders, and led to a steady flow of offers to record and tour. While he was certainly up to the task musically, the social constraints of his addiction was getting to a point so critical as to being life threatening. Career would soon be a secondary consideration to his own personal health, and the challenge to not succumb to this disease that had taken so many brilliant artists of the genre over the previous forty years. "I went to NY and played sessions and things, and completely goofed up. I had some offers to play from Jack Walrath on tour. I got to the rehearsal late, and all kinds of things. I went to England with Slim Gaillard. We did an album, Jay McShann was on piano, and Buddy Tate was on tenor. The guys from Tubby Hayes' old band,"
It was 1982, and Thomas returned to Seattle to address his illness which had by this time completely dominated his life. His fate seemed to be tied to that which had taken so many of the greats that preceded him. He knew the stability of family, and familiar surroundings were important factors in finally staring his addiction down, and placing it firmly in his past. "That was the end of the line where I went into a treatment facility, to get that part of my life handled," he recalls with a sigh. He would spend the next three years fighting this battle, until completely free of drugs in 1985. Blues For McVouty (Stash, 1993) followed, with Thomas using the Slim Gaillard McVouty tag for the title. He once again retained the services of Walton, Israels, and Higgins, and added Dave Peterson, a northwest guitarist with a beautiful sound and advanced sense of harmony. Recalls Thomas, "Albert Marx put it out. I signed it all away, and later on, one of the cuts was picked up by the Beastie Boys. It was on YouTube, they sampled it. They sped it up and put conga drums on it. You couldn't even hear Billy Higgins anymore, and they replaced my solo!" Meanwhile, Thomas began to enhance his resume with impressive recording and performance credits. He teamed up to record with legends Ray Brown and Elvin Jones. He toured with the concert bands of Maria Schneider, Frank Wess, and Bill Holman. He played festivals with Rodney, Sullivan, and Herb Ellis, and again toured Great Britain with Gaillard. Thomas was featured in a full page article in the Wall Street Journal by Nat Hentoff in April of 2000. It appeared that finally the jazz world would become fully cognizant of this master of the realm, sequestered in the great northwest. Stated Henthoff, "Mr. Thomas, at 51, is not a household name among many jazz listeners, although his recordings have been warmly reviewed in some of the jazz journals. He has appeared on more than 50 CDs, mostly as a sideman, and has a following in Japan, where he often plays. But his career reminds me of what Coleman Hawkins, the magisterial tenor saxophonist, once told me about hearing a very impressive player in Oklahoma. 'I told him that you've got it, but you'll never make it until you make it in New York.' Hawkins said. He could have also included Chicago or Los Angeles, but there are indeed formidable, largely hometown players around the country who never have broken through to the big time." Still, despite being sober for fifteen years, Thomas' musical prowess did not translate to a keen business sense, and he flatly did not take advantage of the huge opening career wise the Hentoff article provided. States Thomas, "Huge! I had no snap in follow up." Today Thomas is a member of one of Japan's leading big bands, CUG (Continued in the Underground Jazz Orchestra), and co-leads a sextet with Kohama Yasuhiro and Atsushi Ikeda. Jay records and performs in Japan several times a year, and is currently in the studio recording with Japanese piano/trumpet phenom, Yuki Hirate. In typical Thomas fashion, he came upon these opportunities by accident, or as he states, "I was looking for a good flute." "The Japanese thing was an accident. I was over there working with Geoff Harper, Josh Wolfe, and Becca Duran, at a hotel. We played three half hour sets and we're done at 9 PM. I had been there a few times and never got hooked up. I was trying to buy a high grade Japanese flute," he says. He went to a music store and flashed a custom mouthpiece that he might use as payment. The sax teacher teaching upstairs came down, attached the mouthpiece to his instrument and played. He was obviously a good jazz player. He gave Jay a card for the jazz club Star Eyes, and his gig there on Wednesday night, at 9 PM. The three of them walked to the club. It was Kohama. The connection was made, and the trio went out to eat together. They saw Jay's impressive resume, with so many greats in jazz history, and were very accommodating. He went over for a tour, and recorded, bringing along with him top Seattle players David Marriott, and Mark Taylor. A deep musical connection was made, and more importantly, a great friendship that crossed cultural and linguistic lines, steeped in the quintessential American art form so revered and respected in Japan. Thomas has attained iconic status there, an irony plain to see after the amazing trials and tribulations of his jazz life in America. While most jazz talent arises from academia these days, finding most young players graduating from schools like Berklee, New School, and Manhattan School of Music, Thomas provides mentorship in the oral tradition much like his experiences as a teenage phenom in Seattle. He has held an adjunct professorship at Cornish College of the Arts, and works individually with students at the nationally renowned program at Garfield High School in Seattle. But those fortunate enough to study privately with him are treated to an individual approach that places an emphasis on ear training. Thomas has never forgotten the sage advice he received from his elders on the Seattle scene. "I just remember like it was yesterday, asking everybody how they did things, and I would get a lot of different answers. All of them were correct," he recalls. He adds, "The thing is to find what they're willing to do. I show them to not be afraid to test their ears. If they can match a note, I tell them,'Your ear is great, it's functioning fine.' The music has got to be in your head. Then we can do something with it on the instrument." In what can be described as a career defining project, Thomas had it in mind to do a ballads album, something that could place firmly in center his beautiful tone, melodic approach to improvisation, and ability to produce a virtual kaleidoscope of sounds from five instruments. 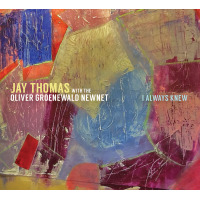 I Always Knew is essentially that, with Thomas soloing between the layers of harmonic color within the rich and adventurous arrangements of Oliver Groenewald. Thomas and Groenewald developed a friendship and musical kinship upon Groenewald's arrival in the northwest from his native Germany. An ace trumpeter and skilled composer and arranger in the tradition of Gil Evans, Phil Woods, and Gerry Mulligan, Groenewald lives on Orcas Island with his family. From that remote outpost in the San Juan Islands, he creates broad pallets of tonal colors in his arrangements, and counts many of the top players in Seattle and surrounding areas in his Newnet. Groenewald sent over some charts, and Thomas went about the business of putting a band together. He first grabbed the rhythm section from his band The Cantaloupes. Bassist Michael Glynn, drummer Adam Kessler, and pianist John Hansen became the harmonic center from which Groenewald's colorful arrangements could flourish. He then added alpha lead trumpeter Brad Allison to provide a melodic context. The album is recorded without isolation, in one room collectively. The room itself has a beautiful sound, and Thomas wanted to utilize that without any encumbrances getting in the way of the natural communal sound. "This was a labor of love, it had nothing to do with how I'm going to make anything back," states Thomas. Groenewald as well looked forward to the project, writing beautiful arrangements for compositions by a variety of composers such as Lee Morgan, Dexter Gordon, Duke Ellington, and Groenewald himself. Thomas chose Origin Records to release this latest work, and for good reason. With trust being a huge factor in any creative endeavor, or for that matter, in any business transaction, Thomas' relationship with Origin principal John Bishop dates back more than 35 years. Their friendship has been developed largely on the bandstand and in the studio. A fine drummer with performance credits that include the groundbreaking Hal Galper Trio, Bishop has a firm understanding of Thomas' creative language, and what this recording means in terms of establishing his friend's legacy. While Thomas has appeared on many recordings, and has produced fine records of his own, Origin's stellar reputation and superior distribution model will put I Always Knew into the hands of radio stations, and jazz media on an international scale. In the age of digital media, the music of this jazz warrior will perhaps take its place among the top jazz artists of his era. It should call attention to the lyrical prose that is his signature, to the broad and pure sound that is his identity. The jazz public at large will at last become engaged with his unique sense of musicality, with the genius hidden within, the gift of ardent creativity, that which "we always knew" in the Pacific Northwest. Oliver Groenewald's NewNet on FaceBook. Check out his site here.